Applying for the loan or mortgage is a normal activity in this competitive world. People always look to expand their business and require purchasing new property. For this, enough money is needed. For filing for the right amount of loan, you need to provide the proof of the income. This is the reason that California Bank Statement Loans have gained popularity among the self-employed business owners or investors. 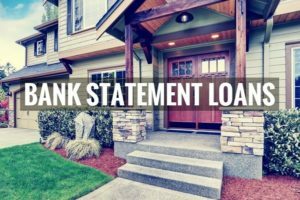 What is Bank Statement Loans? If you are an investor and need to purchase any property, you often need to show the adequate earning. For this, people of California need to look for the California Bank Statement Loans, as they allow the self-employed to provide the adequate average monthly deposit to the personal or business bank account instead of the traditional income proof. The other pay stubs like a tax return or the income proof for the mortgage payments best replace this. There are people who earn enough money but do not qualify for the loan using their tax return or the income proof forms. So a program is designed to help such people and qualify them to avail different loans. For this, brokers are the right professionals who know how to make you qualify for the loans even if you are not able to qualify after the business write-offs. When agent helps you in calculating your income by adding the deposits of your business, they make use of the California Bank Statement Loans. In this, they add your personal or business account information for the 12 or 24 months and divide them by the same number to get the average monthly income. In this, any transfer between the accounts is not considered. This is an effective method for the business owners to calculate their income based on the gross deposit. Do you know by real estate brokers are so important to avail the California Bank Statement Loans? It is important that you know whether the Bank Statement Loans suitable for you or not. Only the professional agents can identify this and guide you the best option. For this, you can contact them anytime and get answers to all your queries and doubts. The market is filled with the licensed loan specialists who work for the client’s benefit and help them to handle all the loan process or the mortgage activities for a genuine fee. Who is benefitted by the California Bank Statement Loans? These types of loans are the best option for the self-employed clients or the owners who find difficulty in facilitating adequate income documentation for the loan approval but can provide proof of the sufficient deposits to the bank account or the business. This may be in the form of the paystubs, income tax return or W-2s. From who to get support for the best Bank Statement Loans? Hire the best broker for availing the best Bank Statement Loans if you are new to dealing with the sales and property management. For this, enough number of property agents is available over the internet and in the real market. Just visit their website and you will find a complete solution for the California Bank Statement Loans. They have the best experience to deal with the different mortgage and loan processing for different properties. Their support is to find the best loan options with the lowest interest and easy repayment option. Why Find the Orange County Property Management Firm?